Mimi Guest, United Way divisional coordinator for the Krieger School, designed and sewed the Ravens quilt signed by 31 players and Coach Brian Billick. 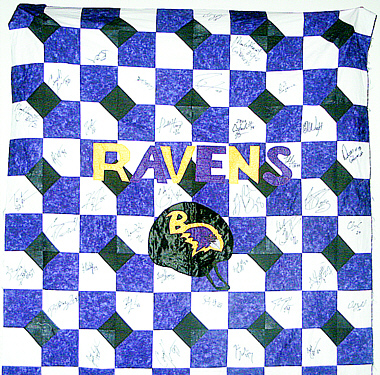 Just a week to go to the final bidding for the autographed Ravens quilt being auctioned for the United Way campaign. The 60-by-50-inch quilt was designed and sewn by Mimi Guest, system administrator and United Way divisional coordinator for the Krieger School of Arts and Sciences. Over the summer, Guest and JHU United Way administrator Lesley Giles visited the Ravens training camp to collect signatures. Signing on were 31 players — from No. 2 (Anthony Wright) to No. 98 (Anthony Weaver) — and head coach Brian Billick. Others included Matt Stover, Kyle Boller, Dave Zastudil, Chester Taylor, Ray Lewis, Jonathan Ogden, Todd Heap and Adalius Thomas. Bidding starts at $150 and can be raised in increments of $25 or more. The deadline is 5 p.m. on Monday, Dec. 6. The winning bid will be announced at the Johns Hopkins University United Way Thank You Breakfast on Wednesday, Dec. 8. Individuals submitting bids before the deadline will automatically receive an e-mail if someone makes a higher bid. To learn more about the quilt, go to www.jhu.edu/unitedway. For answers to specific questions, contact Lesley Giles at lgiles2@jhu.edu or 410-516-0373.